The Northampton Student Teaching and Representation (STaR) Awards are held annually in partnership between Northampton SU and the University of Northampton. 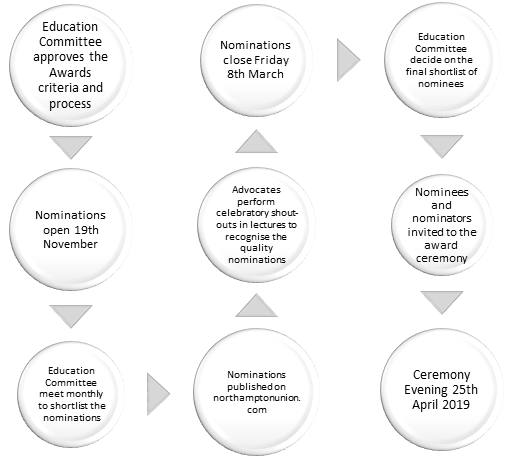 The Awards are student-owned, with each category and criteria being determined by students, as well as nominations, shortlists and eventual winners. The STaR Awards are held in high regard across the University of Northampton. They not only offer students a route to recognising outstanding teaching/learning and support/enhancement of the student experience, but also provide inspiration to University members of staff. They also offer University staff an opportunity to recognise the exceptional work and contribution that Course and Faculty Advocates make to the student experience. To celebrate excellence across the University.